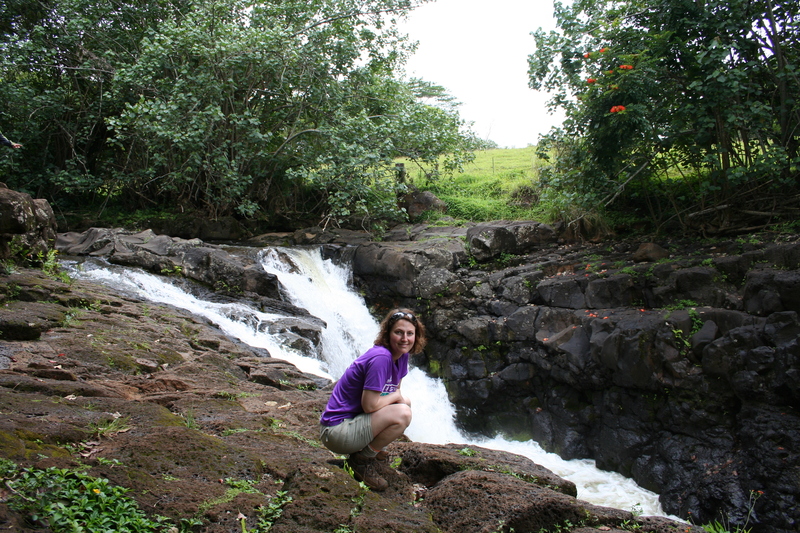 If you want a hike in Kauai that takes you off-the-beaten path to waterfalls that mostly only locals know about, this hike is for you. The Ultimate Kauai Guidebook outed this trail, calling it the “Best Hidden Gem” of the east shore, but even with this guidebook cred, the hard-to-find trailhead and entirely unmarked trail keep it quiet and relatively tourist-free. We saw more wildlife along the trail than people, including a wild boar that ran past the trail, frogs, tadpoles, a plethora of birds, lizards and fish. 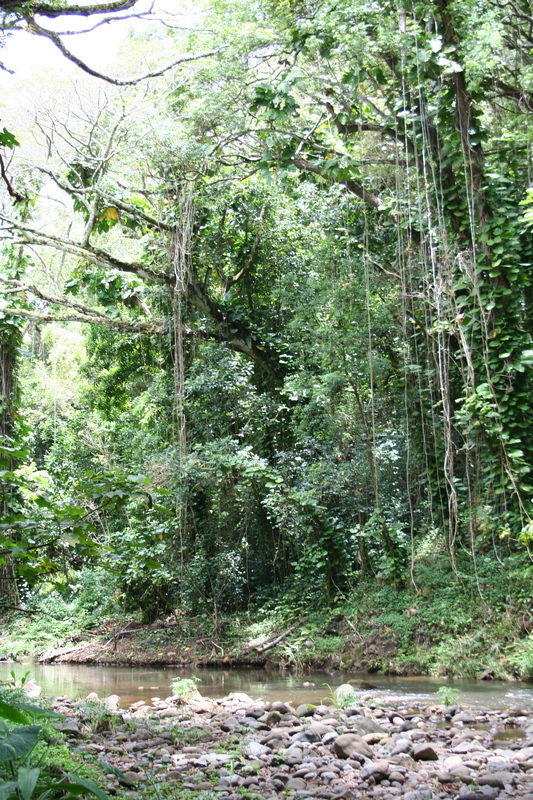 The short, moderately difficult 2.2 mile hike along the Kapa’a Stream will take you up close to two waterfalls, both known as Ho’opi’i Falls depending on who you are talking to or which map you are using. If you are directionally challenged or nervous about hiking unmarked trails, I recommend using our GPS track for reassurance or downloading the The Ultimate Kauai Guidebook iPhone app which includes a location aware map with the trail track as well. The trail is on state land, but is also near residential homes so please be conscientious of the nearby neighbors and private property along the route. UPDATE 5/1/2016: A commenter recently reported that at least one trail to the lower falls is now closed off as it went through private land. Here’s an article about it from TheGardenIsland.com. Please obey any signage and avoid trespassing on private property. 1. 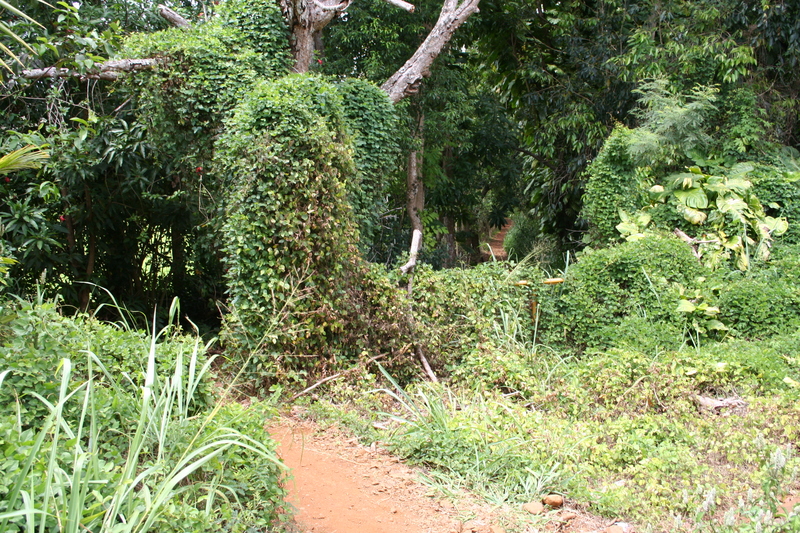 The trail begins at what the Ultimate Kauai Guidebook calls an “old public dirt road.” Don’t let this description fool you; it’s not like any road on the mainland. See this photo to see what it looks like so you know what you are looking for. An old metal gate in front of the “road” is completely overgrown and once you walk past that it’s hard to believe this used to be a road. 2. Follow the road down a steep slippery-when-wet hill for the first quarter mile or so. Hiking poles will be useful if you have them. 3. 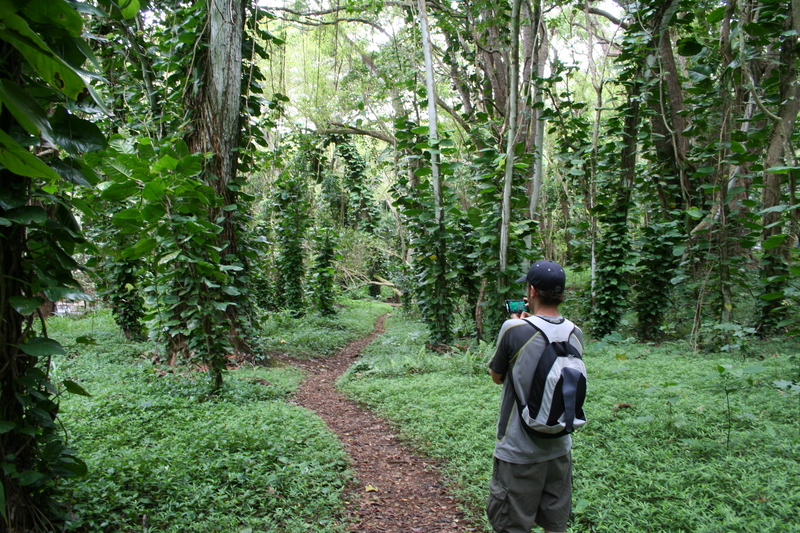 When the trail levels off a little you’ll see several fairly large/distinct trail options that turn toward the left and go down toward Kapa’a Stream. From what we could tell, all of them lead to roughly the same single track hiking path, so take whichever one suits your fancy. 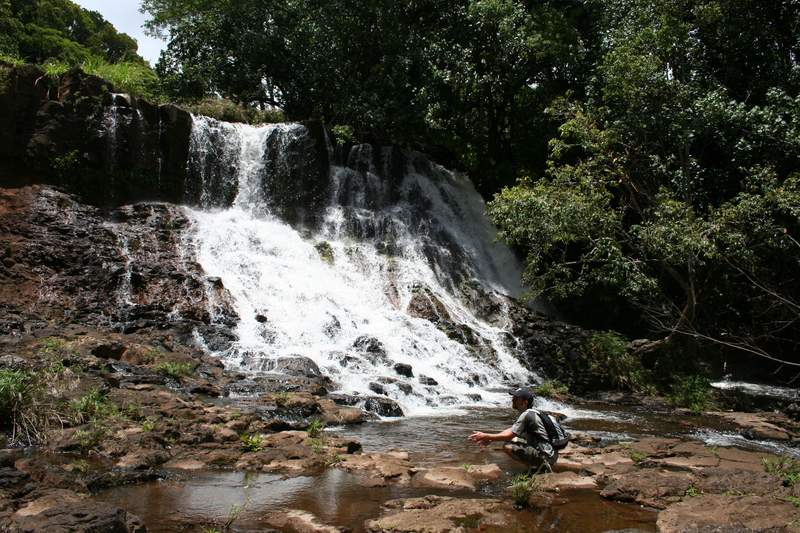 This should take you to your first up close look at the Kapa’a Stream. 4. Follow the smaller single track trail along the stream. 5. You’ll hear the Upper Ho’opi’i Waterfall before you see it. There were several tracks to the left leading down the muddy, slippery slope toward the falls. We took the second of them, but I think any would work; you may just have to walk a little along the stream to get the falls itself if you don’t take the one that leads right to it. 7. Shortly after this dense grove begins to open up, you’ll have a directional choice: Wider path curving to the right away from the stream or smaller single track to the left/ahead of you. Take the left route, which will bring you back near the stream edge. 8. 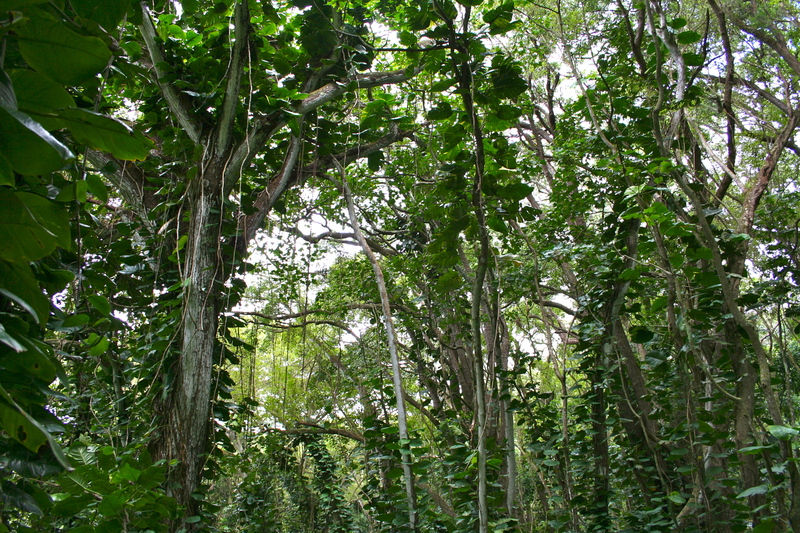 At this point you’ll be in a forest of trees covered in philodendron vines with a fairly easy to see trail [Photo]. The trail will come to a T shortly. If you take it to the left, you will come out at the top of the Lower Ho’opi’i Falls with no safe means to get down them, but still a nice place to take in a view. If you go to the right, you’ll head uphill again past the falls where you will get an option on your left to follow a steep, slippery trail down to come out at the bottom of the falls. I recommend giving them both a go; it’s a short hike and you have time to explore a little. Just watch your step on all the slick slopes. 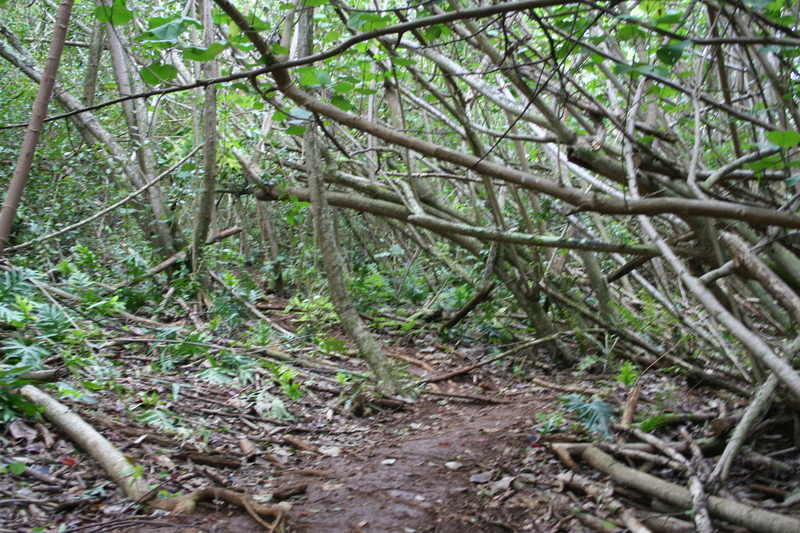 Note: The trail does continue beyond where you go down to the Lower Ho’opi’i Falls. So the turn off to head down isn’t at any “end” to the path you are on. While the trail is short, it isn’t easy for two reasons: navigation and terrain. You won’t have trail signs to help you, nor will you have a well maintained path for much of this hike. In places it may be barely a single track, in others you may have a few options to choose from. It’s worth knowing that you will never cross the stream but for the most part, you will be following it. As mentioned in the trail description above, there is one part through some dense forest that comes inland from the stream but other than that, you’ll nearly always be following close to the stream’s edge. For peace of mind, I recommend using our GPS track for reassurance or downloading the The Ultimate Kauai Guidebook iPhone app which includes a location aware map with the trail track as well. This isn’t a well-maintained park trail. 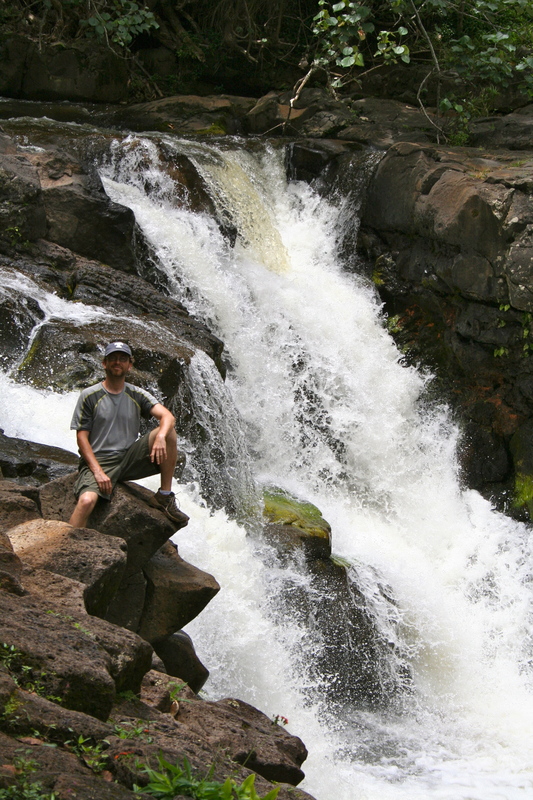 There are some very steep, slippery parts, especially as you are trying to scramble down to either of the falls. Take your time and don’t go anywhere you don’t feel comfortable climbing back out of. Of all the hikes I’ve done on Kauai, this was the only one where bug spray was an absolute must. The mosquitoes near the falls were blood-thirsty and prolific. Here is an approximate Google Map of the trailhead. There’s room for two, maybe three, cars on the shoulder of the road beside the trailhead. This is a residential area, so be cognizant of the homeowners if you need to park elsewhere on the street. Perfect instructions and great photos. We hiked it this morning, thanks! Dave & Angela: Glad you enjoyed the hike and the description was helpful. Hope you have a great rest of your stay in Kauai! Found the trailhead, just as you described! Thanks for such detailed directions! A great hike! Thanks for the great description and gps track. I liked this much more than the Blue Book description. The gate is now painted red & gray and is very easy to follow. There were alot of people on the trail the day we went, even looked like a guide taking a family. 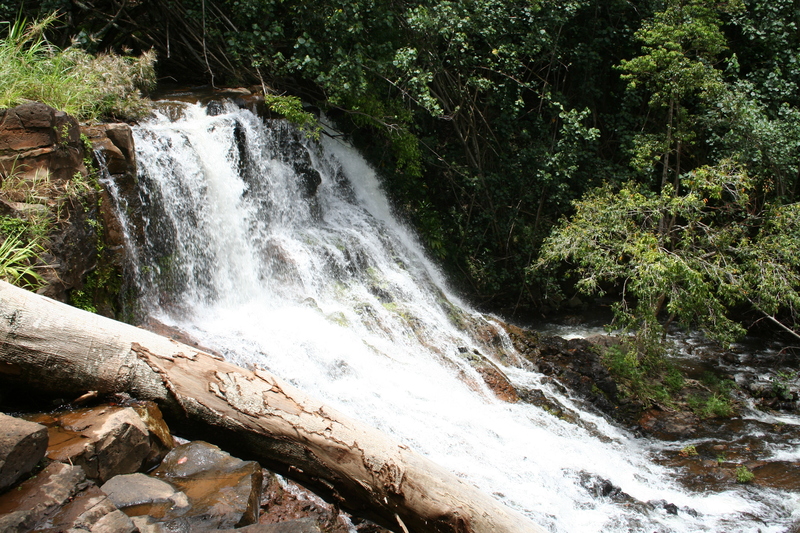 Also lots of children, so not too difficult for kids – just watch the slippery spots and the steep treks down to the falls. Another alternate way to get to the upper falls is to hike directly on the rocky area on the right edge of the stream (with the stream to your left and the trails uphill to your right). This may depend on the water level though (would be dangerous if the water flow is heavy), as there are a few parts where you may have to step right into the stream if you’re not flexible/tall enough to perfectly traverse the rocky bank. Also I’d like to mention (since it’s not mentioned here) that the upper falls is a somewhat popular swimming area, so many people on this hike actually come to dive off the top of the upper falls into the water. It’s pretty common to see a group of people hanging out in swimwear at the upper falls. The lower falls lacks a swimmable pond at its base, so the lower falls is mainly for just picture-taking. We just heard that Hoopii Falls is now closed. Does anyone know if that is true? Hiked down to the falls today and took the closed trail after hitting a dead-end on the riverbank. Didn’t realize the controversy. It’s an amazing area and I can understand why the leaseholder wants to protect it. Hi there!!! What an amazing little gem of a spot! My family of six had an awesome time cliff jumping and playing on the other rope swing. We did notice, albeit small, something biting our toes getting out of the water. At first I thought it was my imagination and then it bit (not hard) again. My husband said the same thing! We noticed a striped black and white fish, but now I am curious what it was. It was more than just a brush of a fin…more like a nip!! It was enough to make me scream like a baby! Thoughts on what kind of fish it was! ?